November | 2014 | The Loudest Librarian! 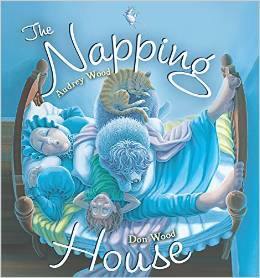 A fun, cumulative rhyme about a pile of sleepers that includes a granny, a child, a dog, a cat, a mouse, and a flea. I like to read it in a hushed voice until the dramatic turn in the middle, when the flea bites the mouse. The kids giggled as the pile of creatures grew bigger and bigger, and laughed when the bed broke. Margaret Read MacDonald is a master at retelling old tales. 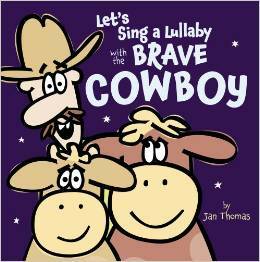 Her picture books usually include lots of repeated words or phrases for kids to chime in on. A few weeks back, I read Pickin’ Peas, which one family enjoyed so much that they returned to the library later in the week to check out. 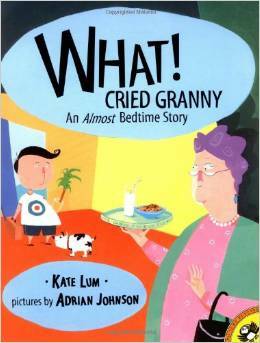 This story is about a little boy who is sleeping over at his grandparents’ house. At bedtime, his Grandma says, “Now when I turn off the light, and close the door, are you going to be scared?” “NO! NOT ME!” says the boy. But when she closes the door, it makes an awful squeak, and the little boy cries. So Grandma brings in the cat to keep the boy company. But of course the door squeaks again. So Grandma brings in the dog. The story gets more and more absurd, as more and more animals crowd into the bed. The kids and parents laughed at Grandma kissing the pig goodnight, and dressing the horse in pajamas, and the kids loved saying the repeated, “No! Not me!” every time. Always a hit. This is one of my all-time favorite read-alouds. It works well for a wide range of ages. 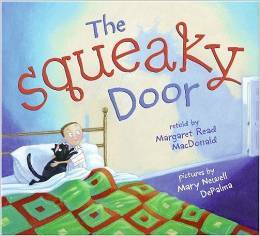 Like The Squeaky Door, it is about a little boy (whose name is Patrick) sleeping over at his Granny’s house. But when Granny tells Patrick to climb into bed, he informs her that he doesn’t have a bed there. “What?” cries Granny, and rushes out to cut down some trees and build Patrick a bed. But then she discovers he doesn’t have a pillow. This book is great for promoting print awareness (you can point out the word “What? !” which gets bigger and bigger every time it is repeated), and prediction (the kids enjoy guessing what Granny will have to make next. But it’s also just a funny story, with big, brightly colored illustrations. Whenever I have a Mo Willems book in my storytime stack, the kids always spot it right away, and demand that I read it. 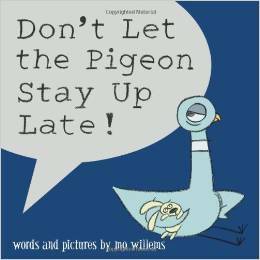 So it was no surprise when someone shouted out, “Read the Pigeon book!” This one, like the other books about that naughty Pigeon, encourages the kids to say “No!” to the Pigeon’s constant wheedling, this time about why he should be allowed to stay up a little longer. “I’ve got the whole bed to myself! I’ve got the whole bed to myself! “Yes! More monkeys jumping on the bed! Yes! More monkeys jumping on the bed! That is what the children said. I was originally going to read Silly Billy by Anthony Browne to introduce the worry doll idea, but the copy I ordered over from another branch didn’t arrive in time. 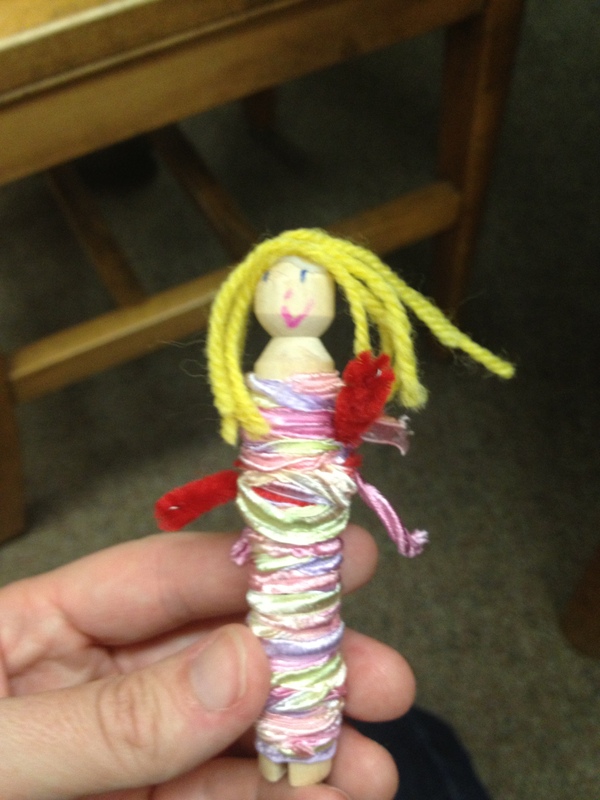 The kids loved making the worry dolls anyway. If you aren’t familiar with worry dolls (also known as trouble dolls), they are a tradition that comes from Guatemala, where kids are given tiny dolls to tell their worries to, and keep under their pillows at night. The book Silly Billy is about a boy who has so many worries that he makes worry dolls for his worry dolls. 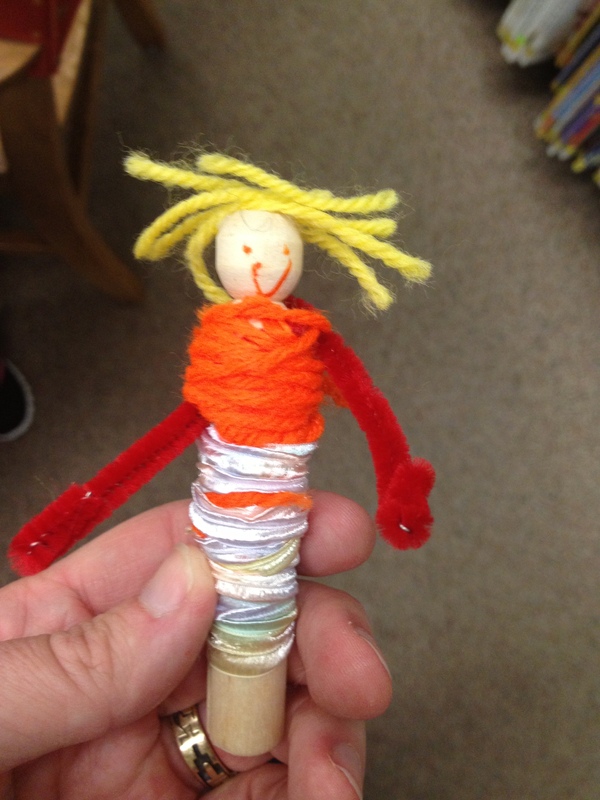 For our worry doll craft, I gave the kids clothespins (the kind with the round top), markers to draw faces, pipe cleaners for the arms, and kids’ scissors and multicolored yarn to make hair and clothes. We used gluesticks to stick the hair on, and wrapped the yarn around the clothespins for the clothes. The kids needed some help securing the ends of the yarn (I tucked the ends under the wrapped part). But the parents seemed to enjoy helping with the dolls, and the kids were excited to take them home. What are your favorite books about bedtime?